Speed, precision and effective strategy with a fencing saber has taken Ibtihaj Muhammad on business trips to bucket-list destinations like London, Paris, Italy and Morocco — and next summer, if all goes as planned, to the Olympic Games in Rio de Janeiro — but her business savvy and eye for design may end up making her a regular visitor to those fashion-forward locales. 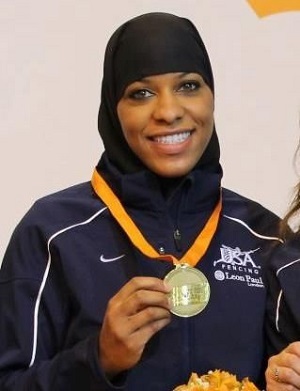 Muhammad, 29, is a four-time medalist at the fencing World Championships — one gold and three bronzes with the United States in the team saber competition — who is known most for being the first Muslim woman to represent the U.S. in international fencing competition and the first woman to compete while wearing hijab. It’s also made her think about a future beyond fencing, which is part of how she became the owner and face of “Louella,” a small company which designs, manufactures and sells women’s clothing. A three-time All-American at Duke, where she earned dual bachelor’s degrees in international relations and African-American studies, Muhammad launched the business with her siblings last spring after feeling frustrated by the lack of modest women’s clothing in the marketplace. She mentioned to her brother that she was having trouble finding a dress for an event — one that wasn’t too short or tight fitting — and he suggested she start making her own. “I think there are other companies (that make modest clothing), but I don’t think they have the same reach,” Muhammad said. Louella has 9,200 followers on Instagram and nearly 6,000 Facebook likes. Muhammad has about 40,000 likes on her own Facebook fan page. Three years ago Muhammad narrowly missed making the Olympic team for London. She said the attention she received in the Muslim American community for her fencing achievements made her realize her name should be attached to whatever business plan she and her brother developed. With the opportunity has come long hours of Face Time chats and collaborating with her siblings on the business. Her three sisters help with all facets of Louella — brainstorming design ideas, choosing fabric, modeling the clothes for marketing and managing the warehouse. Louella has grown quickly, expanding its clothing line and its presence online. When she’s not traveling the world to compete, Muhammad balances cross-training, fencing with teammates, including her sister Faizah, and lessons with her coach with the demands of running a small business. When she’s on the road for fencing, she brings her laptop to stay connected. Muhammad’s next major competition will be the 2015 World Championships in Moscow, and then the 2016 Olympics in Brazil.